Located in Southern California, San Luis Rey Downs is the only auxiliary training track continuously approved by the California Horse Racing Board since 1984. This means that horses can ship from San Luis Rey Downs and run the same day. They are not required to be at the track 24 hours ahead of their races. Unlike the tracks in the California racing circuit, San Luis Rey Downs is open for training every day, 365 days a year, enabling trainers to develop a permanent home. 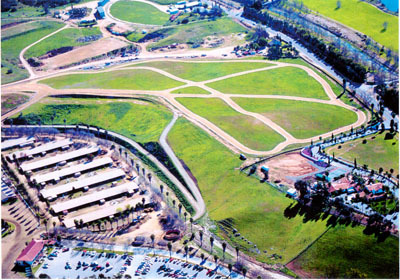 The San Luis Rey Downs facility has a well-maintained one-mile track and a smaller training track. There is 24-hour security with no unlicensed people allowed on the grounds. During training hours, there are outriders, official clockers and an official gate crew. All works are timed and published in the Daily Racing Form. Many outstanding horses, including Azeri, Cigar, Sunday Silence, and Fusaichi Pegasus, have left their footprints on the San Luis Rey Downs track. Four Kentucky Derby winners have begun their early training at the facility (Fusaichi Pegasus, Sunday Silence, Gato Del Sol and Ferdinand). And for the recent past, there have been several graded stakes winners, including Horse of the Year Azeri, shipping out to race and returning to their familiar SLRD stalls at night.